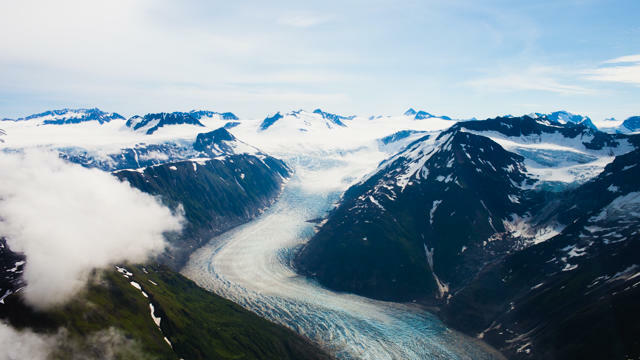 Ice fields near Glacier Bay, Alaska. It’s time to plan your weekend! Here with inspiration: our 5 favorite travel finds of the week. DaydreamBald-eagle and grizzly sightings. Glacier hikes. Salmon fishing. Train rides and float-plane trips. The recent Alaska adventures of Sonja and Alex Overhiser—the husband-and-wife team behind healthy-food blog A Couple Cooks (and my pals from college)—made me swoon. You’ll probably want to plan an AK trip, too, once you see their photos from Juneau and Glacier Bay. The view from Sonja and Alex’s rental house, near Juneau, Alaska. SeePhotographer Jeffrey Milstein’s geometric aerial photographs of L.A. are on display at L.A.’s Kopeikin Gallery through Aug. 22. EatChowhounds, you’ve got to make a choice this weekend: Venture north and eat your way through the Seattle Street Food Festival (Aug. 14 – 16), or hit up the San Francisco Street Food Festival (Aug. 15 – 16). Serious food-truck fans: Hit up both, and Godspeed. ReadOne of my favorite childhood books, modernized, and transferred to NorCal? Yes, please. I knew I wanted to read Ana of California as soon as I heard that it was inspired by my beloved Anne of Green Gables. Now that I’ve started the 2015 novel—by L.A.-based Andi Teran—I want to pack my bags and head for a farm in Humboldt. Looking for more travel inspiration? You can find past travel roundups here, here, here, here, here, here, here, here, here, here, here, here, and here!